Preheat oven to 400 degrees. Toss asparagus with EVOO on a rimmed cookie sheet, arrange in a single layer, and season with S & P.
Whisk together the lemon juice, EVOO, garlic, and S & P in a large serving bowl. Stir in the grated cheese and set aside. In a separate small bowl, combine the lemon zest and parsley. Pop the asparagus into the oven and roast for 20 minutes. Bring a pot of water to a boil. When rolling, cook your pasta as needed. When ready, remove pasta with tongs into the serving bowl (don’t worry about a little water getting in as that will help bind the sauce to the pasta). Gently toss to coat with lemon sauce, then add the lemon-parsley mixture and toss a bit more. 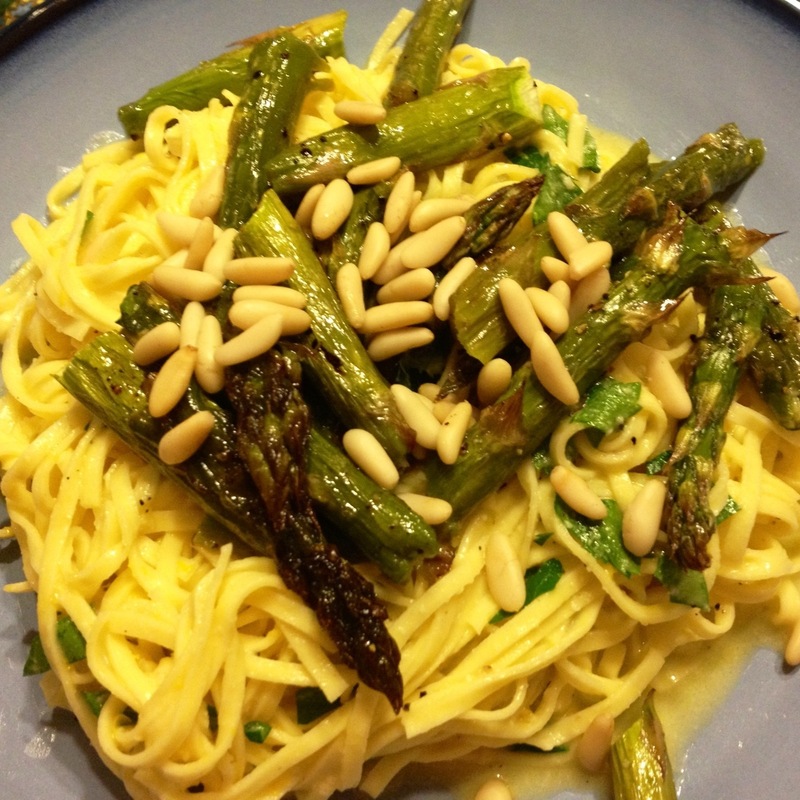 Remove asparagus and chop into large bite-sized pieces. Grab a big helping of pasta with the tongs and plop it on a plate. Top with a good amount of asparagus. Sprinkle with pine nuts. Dig in!